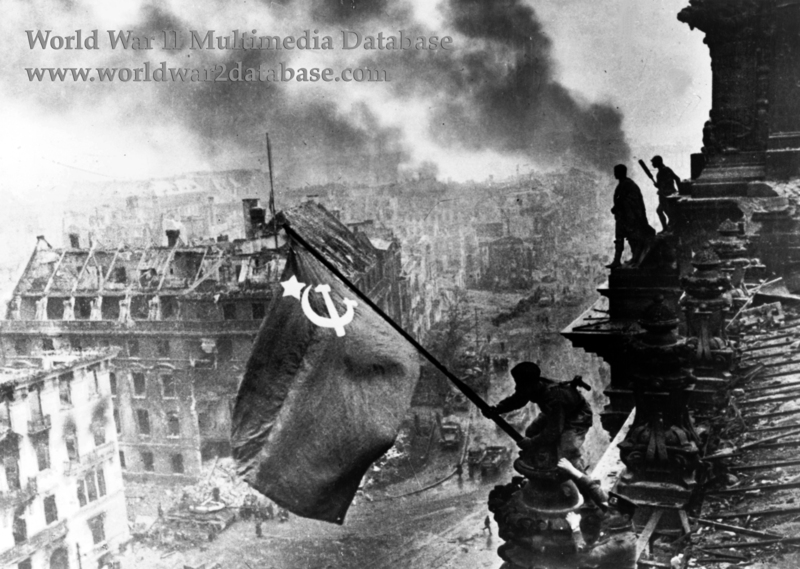 In this famous composite image by Yevgeny A. Khaldei (March 23, 1917 - October 6, 1997) Soviet Red Army soldiers raise a Red Flag over the Reichstag on May 2, 1945. This view looks down Hermann-Goring-Strasse (Ebertstrasse today) towards the Brandenburg Gate. A Josef Stalin IS-3 tank is on the corner of Hermann-Goring-Strasse and Dorotheenstrasse. The building by the tank survived the war and is an office building today (Friedrich Ebert Strasse 25), its exterior pockmarked by war damage covered by concrete. The history of flag raisings at the Reichstag is unclear due to wartime Soviet propaganda obscuring the timing of events and deleting the names of participants for political and ethnic reasons. Colonel General Vasily I. Kuznetsov (January 15, 1894 - June 20, 1964) commander of the 3rd Shock Army, distributed special large flags made out of red tablecloths to nine divisions on April 1, 1945, and they were encouraged to be the first to raise their flag over the Reichstag. The location for the flag raising was ironic, because the Reichstag symbolized democracy to Fuhrer and Reichskanzler ("Leader and Reich Chancellor") Adolf Hitler, so after it burned in 1933 he conducted public meetings in the Kroll Opera House. The Reichstag was virtually abandoned from 1933 to 1945, when it was turned into a German fortress. Several reports of flag raisings reached Commander in Chief of the 1st Belorussian Front Georgy K. Zhukov (December 1, 1896 – June 10, 1974) who believed the Reichstag was taken and told Stalin and the press. Yet Soviet correspondents who approached the Reichstag were fired upon by Germans still occupying the building. The Red Army was forced to renew the assault. The first flag raising occurred at 2240 Hours on April 30, 1945, by a team led by Sergeant Mikhail Minin (July 29, 1922 - January 10, 2008), of Vanino, Pskov Oblast, a Razvedchiki ("Scout") attached to the 136th Army cannon artillery brigade of the 79th Infantry Corps of the 3rd Shock Army. Minin later recalled to german television in 2007, “Nobody really wanted to die that night because the war was already won,” he declared. “Even a promise by our officers that those who captured the building would get the highest decoration of Hero of the Soviet Union called forth few volunteers. Except for my little company.” Minin led his men up to the Reichstag and used a mortar with zero-degree elevation to blast through the reinforced door. Scaling the Reichstag stairs in the dark, only one of his men had a flashlight. “But we had no flag with us. Instead we found a pole and a red rag and fixed it into a damaged statue symbolizing Victoria (Germania) on the top of the building. I was euphoric. I had done my duty as a simple soldier.” No photograph of the first flag raising exists, because of the heavy fighting and the night operation to climb to the roof. The Germans removed the flag the next day. Several divisions and smaller units placed their flags on the Reichstag, which the Germans removed or shot down. Some were destroyed by Soviet units in combat or to prevent other units' flags from being seen. A Soviet Red Air Force plane photographed a large banner on the Reichstag on May 1; this photo was widely distributed. Officially, the flag of the 150th Rifle Division was credited with being the first flag over the Reichstag, but other unit flags were initially credited; the actual sequence of events will never be known. Three men - Sergeant Mikhail A. Yegorov (May 5, 1923 - June 20, 1975), of Smolensk, a Razvedchiki of the 756th Infantry Regiment, 150th rifle division of the 3rd Shock Army; Junior Sergeant Meliton V. Kanataria (October 5, 1920 – December 27, 1993) of Jvari, Georgia, a Razvedchiki of the same unit; and Lieutenant (later Colonel) Konstantin Y. Samsonov (June 3, 1916 - December 15, 1977) of Moscow, attached to the 1st Infantry Battalion, 380th Infantry Regiment, 171st Rifle Division of the 3rd Shock Army - carried their divisional flag, which flew over the Reichstag, in the Moscow Victory Parade on June 24, 1945 and were made Heroes of the Soviet Union in a joint ceremony on May 8, 1946. The flag, which was imprinted with 150 str. Ordena Kutuzova II st. Idrick. Div. 79 S.K. 3U.A.IB.F ("150th Rifle [Division, awarded with the] Order [of] Kutuzov of II Degree, [Honor Title] Idritsa division, 79th joint corps, 3rd Shock Army, 1st Belorussian Front"). This flag is now at the Central Museum of the Armed Forces, Moscow. A copy is in the Deutsches Historisches Museum in Berlin. Yegorov, Kanataria, and Samsonov were chosen personally by Stalin, Zhukov and Kuznetsov, who wanted two ethnic Russians and a Georgian to honor Stalin. These three were nationally recognized, but Alexei P. Berest (March 9, 1921 - November 4, 1970), the Deputy battalion commander for political affairs 756th Infantry Regiment, 150th rifle division of the 3rd Shock Army of the 1st Belorussian Front, was also present for this flag raising, but Kuznetsov denied Berest the Hero of the Soviet Union award, giving him the Order of the Red Banner instead on August 22, 1946. Berest posed as a senior officer to negotiate the surrender of the Reichstag with the Germans. Berest believed Zhukov denied his award and publicity because Zhukov didn't like political officers. After the war, he was accused of embezzlement in a controversial trial and sent to the gulag. Released after four years, Berest died in 1970, hit by a train while throwing a baby to safety. He was made a Hero of Ukraine on May 6, 2005. Yegorov, Kanataria, and Samsonov were "approved" as the official participants in Khaldei's photograph as well. Khaldei was in Moscow when he was ordered to Berlin to stage a photo on the Reichstag. Khaldei was impressed with Associated Press reporter Joseph J. Rosenthal (October 9, 1911 – August 20, 2006) and sought to make an image comparable to Rosenthal's Flag Raising on Iwo Jima. Before he left, Khaldei and his uncle, a tailor, sowed flags all night out of red tablecloths given to him by a shopkeeper. Khaldei arrived by plane in Berlin after Berest had negotiated the surrender of the Reichstag, and asked soldiers standing around the Reichstag to climb to the roof to make his photo. He faced away from the Tiergarten side of the Reichstag, preferring to depict the urban area to the southeast of the Reichstag. Khaldei exposed thirty-six frames. This composite image was made out of what he considered the best image, but the sunny day was obscured by adding clouds of smoke from another photo of a burning industrial area. Khaldei didn't notice two watches on the wrists on the man holding the belt of the flag raiser, and his editor ordered him to scratch out one of the watches, which he did with a needle directly on the composite negative. The image was published on May 13, 1945 in Ogoniok ("Little Flame") Magazine. Officially, until 1995, Yegorov, Kanataria, and Samsonov were the men identified in Khaldei's photo. However, Khaldei vividly recalled the names of most of his photo subjects, and he identified Guard Sergeant Alexei Kovalev (May 10, 1925 - September 7, 1997) a Razvedchiki attached to the 83rd Guards Reconnaissance Company, 82nd Guards Rifle Division, 8th Guards Army of the 1st Belorussian Front, as the flag raiser. RTR broadcaster Nikolai Svanidze interviewed Kovalev, a retired firefighter, who identified the other two men with him and Khaldei as Razvedchiki Sergeant Abdullhakim I. Ismailov (July 7, 1916 - February 2, 2010) attached to the 101st Mechanized Reconnaissance Company of the 83rd Infantry Division, 8th Guards Army of the 1st Belorussian Front, and Razvedchiki Leonid Gorichev (c. 1919 - c. 1985). Gorichev died of complications of wounds received in the war. Ismailov, who was wounded three times during the war, was part of the original team that entered the Reichstag on April 30. He was awarded Hero of the Russian Federation on February 18, 1996. The announcement that the identities of the three flag raisers provoked debate in the Russian Federation and the former Soviet Socialist Republics. Some refused to accept that Yegorov, Kanataria, and Samsonov were not the soldiers depicted in the photograph, or that the photograph's daytime setting precluded the history of the nighttime flag raising. Regardless, this has become one of the most reproduced photos of the war.